...that Spartan-IVs and Sangheili participate in War Games simulations together on Anvil Station? This article is about the Mongoose introduced in Halo 3, were you looking for the variant introduced in Halo 5: Guardians, the M290 Mongoose? "Speed is the only protection this vehicle provides; it is unarmored, noisy, and prone to roll-over. It demands a level of skill from its operator that is impossible to expect...during combat conditions." The M274 Ultra-Light All-Terrain Vehicle (abbreviated M274 ULATV), commonly known as the Mongoose, is a United Nations Space Command light ground reconnaissance vehicle designed by AMG Transport Dynamics. A wire frame profile of the M274 Mongoose ULATV. 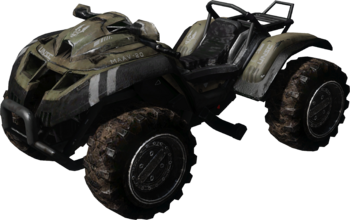 The Mongoose is one of the fastest and most maneuverable ground vehicles in the arsenal of the UNSC Marine Corps. It is a highly effective vehicle for reconnaissance, rapid transportation, swift tactical versatility, and for shooting between positions. A smaller cousin to the ubiquitous M831 Troop Transport, the Mongoose is a small ATV capable of carrying a driver in the middle of the vehicle, and features a rear platform that can be used to carry one additional passenger, although official UNSC safety protocols advise against this. AMG Transport Dynamics manufactured the first predecessors to the M274 in 2483 and have since released seventeen variants of the vehicle, the M247 ULATV being the most recent. Like the M12 Warthog, the Mongoose is a four-wheel all-terrain vehicle capable of going over any obstacle without any difficulty. The vehicle is powered by a 1,000cc liquid-cooled, mid-engine mounted, four-stroke, hydrogen-injected ICE, allowing it to reach at a maximum speed of 95 kilometres per hour (59 mph). As the vehicle carries no armament of its own, having a passenger is essential if engaging in a combat zone. Due to its smaller profile, the Mongoose is a difficult target for both slow and fast moving enemy weaponry, as opposed to the Warthog, whose size is somewhat substantial. For quick and practical deployment, the Mongoose can be transported by a Pelican dropship. The M274-M is an armed variant of the Mongoose. Colloquially known as the "Gungoose", the M variant is armed with a pair of M67 light anti-infantry weapons. 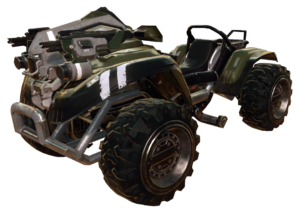 The Mongoose's high speed, light mass, and practically non-existent armor make it unwieldy and difficult to control at high speeds and/or over unstable terrain, making the ULATV vulnerable to destabilization, crashes, and flips. Thus, the standard UNSC Marine Corps operating protocol in engagements against Covenant forces is to place an M41 rocket launcher-armed Marine in the passenger position to fire rockets against slow-moving hostile vehicles, while the driver uses the Mongoose's superior speed to evade enemy return fire. To make matters worse, the design of the vehicle and its lack of armor leave both the driver and passenger completely exposed. Furthermore, with the exception of the Gungoose, the Mongoose does not incorporate any offensive or defensive capabilities, making the Mongoose's only practical defenses an armed passenger and its speed. In a last resort situation, the Mongoose can be used to run over nearby enemies. Yet, attempting a splatter is usually an ineffective plan: The low width and height of the vehicle, combined with the aforementioned instabilities when driving, make it very difficult to successfully score an impact on an opponent. The Mongoose handles better over rough terrain than its incarnation from Halo 3 and Halo 3: ODST . The chassis is more detailed and is slightly larger. The windshield is absent, being replaced by a metal plate which features a mirror on either side. When the Mongoose makes jumps, there is an effect of making the Mongoose appear as if it is traveling through the air very fast. It is now possible to hijack a Mongoose. In Forge mode, it is now possible to give the Mongoose red, blue, green, brown, yellow, pink, or purple decal. In team games, the mongoose is the color of the closest spawning team. Like most vehicles in Halo 4, it has a slight graphical change, giving it more detail and texture look. The color cannot be changed in Forge. Handling has been further improved. The Gungoose is able to defend itself without the aid of passengers. The Mongoose modded into Coagulation in Halo 2. The Mongoose was originally intended to be put into Halo 2, but was eventually canceled. The Mongoose prototype did not fulfill Bungie's expectations for Halo 2, and although Bungie attempted to add dual coaxial machine-guns to it or an armed passenger, it remained unbalanced and didn't fit into the gameplay. Bungie at the time could not figure out a way to implement it into the campaign, and had trouble getting the physics for it right, stating that the whole thing had a tendency to flip very easily, and gameplay wise, had no purpose as it couldn't be driven with the flag and became virtually useless. The addition of the passenger seat gave rise to whole new possibilities and led to its inclusion in the third game. 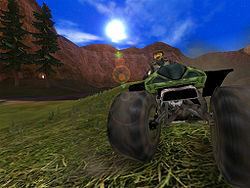 Other Warthog-related vehicles proposed in Halo 2 were also not featured in the final game. During the production of Halo 3: ODST, an NMPD variant of the M274 "Mongoose" ULATV was originally going to be put in the game, but was cut before the game's final release. The M274M "Gungoose" variant was originally to be featured in Halo 2, but was cut; the vehicle was included years later in the remastered multiplayer component of Halo 2: Anniversary. "[The M274] is pretty nimble for its size; add to that the fact that it can do ninety plus kilo papa hotel over uneven terrain and you’ve got the ultimate commando hot rod." "Speed is the only protection this vehicle provides; it is unarmored, noisy, and prone to roll-over. It demands a level of skill from its operator that is impossible to expect from the rank and file during combat conditions. Those not qualified as expert need not apply." "That thing will go from zero to thirty in three seconds on anything short of snow-covered ice." "The M274 doesn't have a radio of its own, isn't equipped with GPS, it doesn't even have any gauges. The only piece of equipment more primitive is the crate it ships in." "The first thing everybody does is yank the front cargo cage – if you were to carry anything on it your forward visibility would be obstructed out to about six meters – that and less weight equals more speed… anyway it's the first thing everybody does." "It's a super versatile ATV in the tradition of the Sperry FCMMagLEV and Willys Jeep; without the former’s vulnerable drive train or the latter's innards-rupturing suspension." "If they're not gonna give us armor they should at least give us a mounted weapon. And you should be able to tow a trailer with it. And, God forbid, you try to ford bodies of water more than seven feet deep." "The M274's range is excellent, and that's even before you consider that you can double or triple its range that without severely impacting its max load – just a couple of jerrys of slop and a carbon feeler." "Some fellas piss and moan about the M274's lack of offensive capability, but it's not meant to be an AFV! Still; with a brave fella riding pillion you should be able to put out enough discouragement to break contact with all but the most bloodthirsty bravo kilo." "The (M274) is definitely the most Buddhist land-based motive system in the UNSC's arsenal...I'll just let that sit with you for a while." A mongoose is used to refer to two types carnivorous mammals, in keeping with the UNSC's tradition of naming atmospheric vehicles after real animals, with the exceptions of the Cyclops and Gremlin, which are named after mythical creatures. Its first appearance in a book was in The Cole Protocol during the Battle of Metisette. This is also its first appearance chronologically, meaning that the Mongoose entered UNSC service during or prior to 2535. 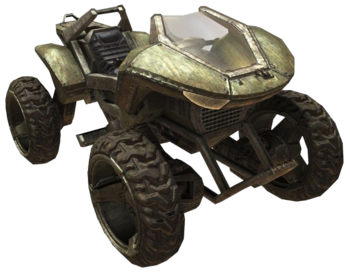 Because Adriana-111 was surrounded by Covenant infantry on rocky terrain, she thought of the Mongoose as "useless" given her then-current situation, as it "just meant you were a biking target"; instead she used the vehicle as a melee weapon against several Grunts. If the player manages to splatter an enemy player with the Mongoose in a ranked free-for-all Xbox Live playlist in Halo 3, the player will earn the Mongoose Mowdown achievement, Scout shoulders, and five Gamerpoints. The Mongoose has a yellow instruction sticker on the deployable passengers seat, stating the maximum weight for the driver and passenger. It is interesting to note that the driver can weigh about 500 kilograms, the average weight for an actual SPARTAN-II soldier. The passenger can also weigh up to 450 kilograms. A SPARTAN weighs around a half-ton, which translates to around 454.5 kilograms, so carrying around another SPARTAN-II as a passenger is possible; however it would seriously damage the Mongoose's suspension under hard acceleration or braking and even the smallest bump or drop would render the Mongoose useless. An early Halo 2 prototype of the vehicle. The Mongoose in Halo 3's multiplayer beta. The Mongoose in Halo 3. 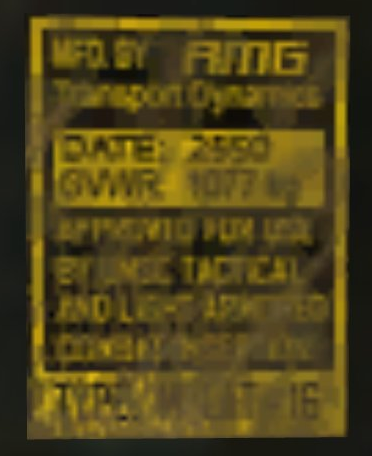 The label on the Mongoose in Halo 3. A Mongoose with arctic camouflage. A Spartan-II on a Mongoose in the Halo 3 Beta. An NMPD variant of the Mongoose that was cut from Halo 3: ODST. The Rookie driving a Mongoose through the streets of New Mombasa. A beta render of the M274 Mongoose ULATV in Halo: Reach. Two Spartan-IIIs driving a Mongoose on Forge World. A turnaround reference of the M274 Mongoose. John-117 using a Mongoose to splatter Promethean Knights on UNSC Infinity in Halo 4. A Spartan-IV driving a Mongoose on Ragnarok. An alternative view of the Mongoose in Halo 4. Two Spartan-IVs riding a Mongoose on Vortex. HUD of the Mongoose on Stonetown in Halo 2: Anniversary. A Spartan driving a Mongoose. A Spartan firing the Gungoose's M67 machine guns.